We stock Hard Temper 304 Stainless Steel fractional tubes. 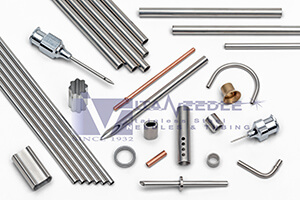 This medical grade fractional tubing is a more robust product and held to closer tolerances than commercial grade annealed tubing. Type SS 304, Medical Grade, Hard Temper. Some sizes available in SS 316. Typically manufactured closer to nominal OD & Average Wall than tolerances indicate.